Beach life is the best life and we refuse to believe otherwise. While we all know that Hyderabad is located a little too far from the coastal regions and we’ve accepted it as a sad state of affairs. But there are a handful of beaches around and these shall make you grab the keys and take off right away. Wondering what they are? Here’s a list of beaches that take less than 8 hours for you to reach. We’re sure most of you might have visited Suryalanka since it’s a popular beach. Located in the Guntur district of Andhra Pradesh, it’s a mere 6-hour drive from Hyderabad. A road trip to this beach takes you through sprawling fields and coconut trees. We recommend camping or booking a cottage on the beach for you to catch the exquisite sunrise and indulge in some bay-side BBQ. While beach volleyball is an option, trying having a chat with fishermen and see if they take you on their journey of fishing. Located in Chirala, Ramapuram Beach attracts visitors from the nearby states too. While Chirala has two beaches — Vodarevu and Ramapuram, our vote goes to the latter because it’s less crowded and super clean. If you opt for a beach resort like Sea Breeze Resort or Palm Breeze Resort, you can take part in the campfires as well. But be sure to make a booking in advance as they are always in demand. Flanked by coconut and palm streets, Chirala is popular for churches, temples, and street markets so you can tour the town when it’s too hot to be at the beach. Sounds like a plan, doesn’t it? Located near Machilipatnam, Manginapudu is a beach-side fishing village which is perfect for a weekend getaway. Popular for its seafood and Krishna Utsav (a festival conducted during the months of February and March), this beach welcomes you with an archway held by two giant fish. Surround yourself by immense greenery and hills which are visible from the beach as well. So, if deep-fried seafood, boundless greenery, and a black soil beach sound like music to your ears, you know where to get, pal! 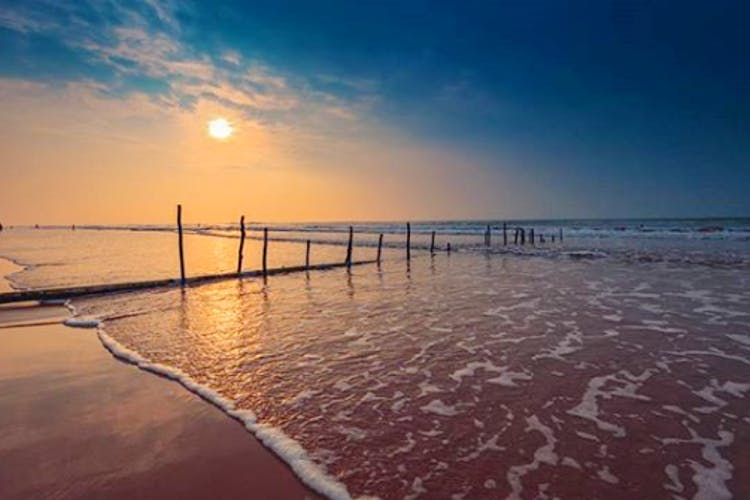 Located in Nellore, Mypadu Beach is a delight to one’s eye. This Bay of Bengal beach has a bridge that reminds you of Pondicherry’s Rock Beach (a popular spot for movie shoots) and is engulfed with towering palm trees. With plenty of water activities, camping, stargazing etc. our soft corner goes to this. Also, the government-run beach resort, Haritha Resorts, will sort your stay too. Antarvedi is the only beach on the list that’ll take a little over nine hours to reach. At a 20 km drive away from Dindi is this beach, which is known for its Lakshmi Narasimha Temple and a clean shore with a clear horizon. There is also a beach trek at Antarvedi which is a 26-km trek that takes you through the coastal areas where you can witness magical sunrises, interact with the local fishermen and go boating, and host a little BBQ night. Popular for its seafood, this region will introduce you to some terrific dishes made from fish. If you got what it takes, go on a fishing excursion and catch a few for your BBQ nights.